‘For the ancient Greeks, the Earth goddess Gaia was the origin of all. Her story has parallels with the creation myths of other cultures, but centres on the role of the mother rather than the father. Creator, nourisher, destroyer, she is the beginning and end of all living things. Over the centuries her influence was eclipsed as the patriarchal gods gained sway, but now we are learning again to pay heed to her old wisdom through the scientific theory and environmental movement which bear her name. ‘The first hymn is a setting of the Homeric Hymn to Gaia. The ancient Greek text is sung by the adult choir while the children sing a simultaneous translation in English. The melody sung by the children is adapted from the Bedhaya Pangkur, a sacred dance of the Central Javanese court gamelan tradition. ‘The second hymn is a setting of the Orphic Hymn to Gaia. In addition to the voices, the music makes use of a single instrument, the bass drum, played with a conventional beater, and on the rim with a birch. The children lead the adults in singing the ancient Greek text, and in a slightly slower central section they chant an English translation. 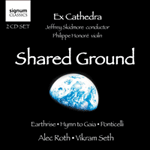 Hymn to Gaia was commissioned by Ex Cathedra thanks to the generous support of David Heathfield and Alan Ingham. O blessed one, our mother earth. And over the grass they dance for joy. And for my song grant me life both full and long. Sacred spirit, mother earth, our blessed mother earth.